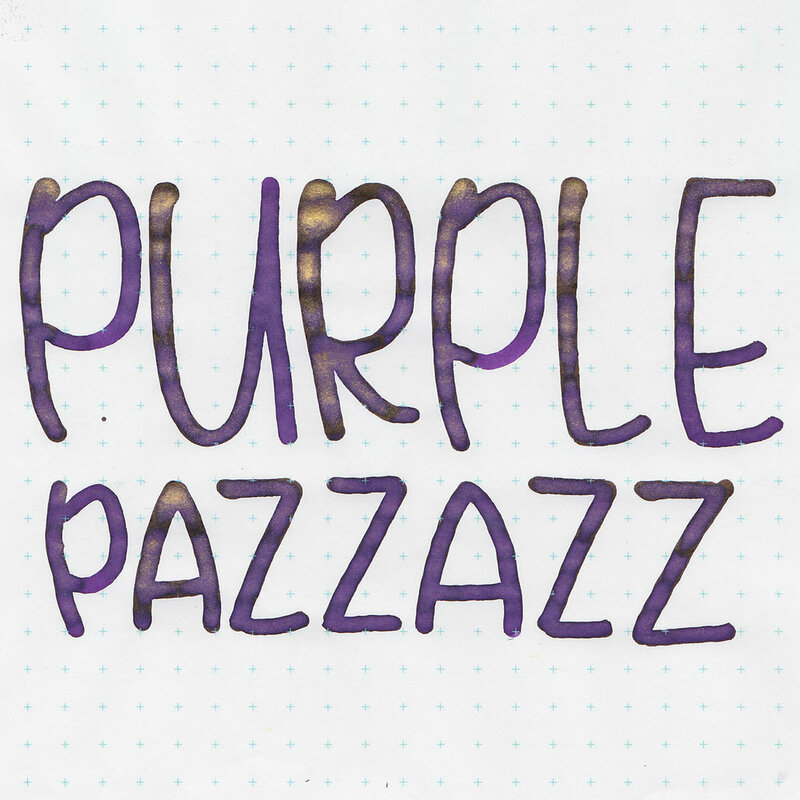 Diamine Purple Pazzazz is one of the original 10 Shimmertastic inks that came out in 2015. I purchased my sample of ink from Vanness Pens. Purple Pazzazz is a medium purple with gold shimmer. I can never get all the shimmer to show up in photos and scans. On the edges of the swab you can see the little bit of gold sheen. The shimmer inks look so nice in ink drops. Bleeding: Low-there is a little bit of bleeding on all of the papers with the flex nib, but did well in the other nib sizes. Tomoe River had the worst bleeding with the flex nib. Other properties: Low shading, a tiny bit of gold sheen (only in large swabs on Tomoe River paper), and gold shimmer. On 32 pound copy paper, there is just a little bit of bleeding and some feathering, mainly in the flex nib. Ink swabs for comparison, left to right (top to bottom for mobile RSS): J. Herbin 1789 Amethyste de L'Oural, Diamine Purple Pazzazz, and Diamine Purple Dream. Amethyste de L'Oural is a little bit cooler in tone with silver shimmer, while Purple Pazzazz is just a touch warmer and has gold shimmer. Click here to see the Diamine inks together. Diamine Grape, Sailor Jentle Nioi-sumire, and Waterman Tender Purple. Click here to see the purple inks together. I used a Pilot Vanishing Point, broad nib on Tomoe River paper. The ink had an average flow, I didn't have any problems with the shimmer. Overall, I think it's a nice ink, but I prefer J. Herbin 1798 Amethyste de L'Oural just because I prefer silver shimmer over gold.